A deli is considered to be one of the simplest restaurants to run successfully. 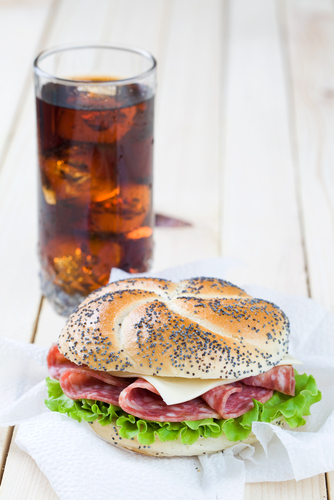 Consumers go to delis when they need a quick lunch that is flavorful, filling, and inexpensive. Delis are simpler to run than other restaurants because they usually offer limited menus, which means that you don't have to worry about stocking a lot of ingredients and food preparation utensils. Deli sandwiches are also quick to prepare, and the staff needed to run a deli is usually minimal. If you are looking for ways to add variety to your menu without hiking up the overhead costs, consider broadening your beverage menu by offering a wider variety of delicious beverages to your customers. The addition of different flavors of coffee, espresso beverages, flavorful smoothies, and other drinks to your menu will help set your deli apart from the more standard establishments in your area. Adding beverages to your menu is simple, and here are some ideas on how to implement these ideas. One of the most profitable beverages that you can add to a deli menu is a lineup of coffee drinks. Whether you offer a drip coffee brew of the day or you deck out your menu with an assortment of espresso drinks, customers will love the chance to linger over a friendly lunch with a hot cup of coffee. Drip coffee is certainly the least expensive addition to your deli beverage menu. If you offer coffee, you will need to offer at least two varieties: regular coffee and decaffeinated coffee. Some delis offer a flavored brew of the day for the more adventurous consumers. Be sure to have a coffee condiment organizer, stocked with plenty of sugar, sweeteners, powdered creamer, or liquid creamer so customers can customize their drink orders. If you want to offer more than just drip coffee, a simple espresso machine will allow you to dramatically increase the number of choices you offer your deli customers. Espresso is an Italian coffee that is very strong. Shots of espresso can be added to hot water or steamed milk to make Americanos, lattes, and cappuccinos. More and more delis throughout the world are beginning to offer more robust coffee beverages to their customers. Adding a lineup of smoothies to your deli menu is a great way to offer healthier beverage options to consumers. Smoothies are easy to prepare using a food blender, and they make a great impression on customers who want to make sure they are getting their daily dose of veggies and fruits. You can create smoothie recipes using whichever fruits are in season, and change them accordingly. Berries, apples, oranges, bananas, and even spinach and carrots make flavorful smoothies when combined with ice, sugar, and milk. The sandwiches and sides at your deli are important, but a varied assortment of hot and cold beverages will dramatically improve your deli's reputation.